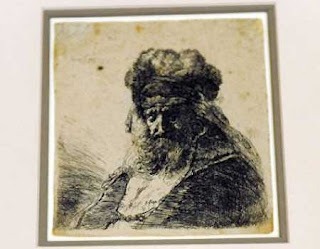 The History Blog posted today about a Rembrandt etching that was discovered in the back of a bathroom cabinet (see above). Father O'Connell, president of the Catholic University of America (Washington, DC) found this etching in the bathroom of his office - he was looking for paper towels and ended up discovering a much older (and non-utilitarian) piece of paper. No one is sure how the etching ended up in the cabinet. The etching was appraised and authenticated as a Rembrandt last year. This week, Catholic University of America opened a new exhibition which features this new discovery. The exhibition will be open until the May 24th. This story sounds so bizarre - who would shove a Rembrandt in a bathroom cabinet? All I can say is, I'm positive that there's nothing that significant in my bathroom.